Home Styles Biscayne Swivel Arm Chair is constructed of cast aluminum with a white finish and Sunbrella <sup></sup> Green Apple fabric Cushions. Features include powder coat finish sealed with a clear coat to protect finish, and nylon glides on all legs. Item Size: 24.4w 22d 33.46h. Seat height 16h. Stainless steel hardware. The Mix and Match sling stack chair features a dark brown finish and sling fabric that complements many exterior decors. Pairs well with a variety of table options to create a customized look. The chairs stack for easy storage when not in use. Turn your patio into the comfiest room in the house with the addition of an outdoor Swivel Glider Lounge Chair and Half. Slightly curved to encourage conversation, this all-weather wicker patio glider features a box-style back and seat cushion. Supportive and comfortable, these cushions are also weather, fade and stain resistant. 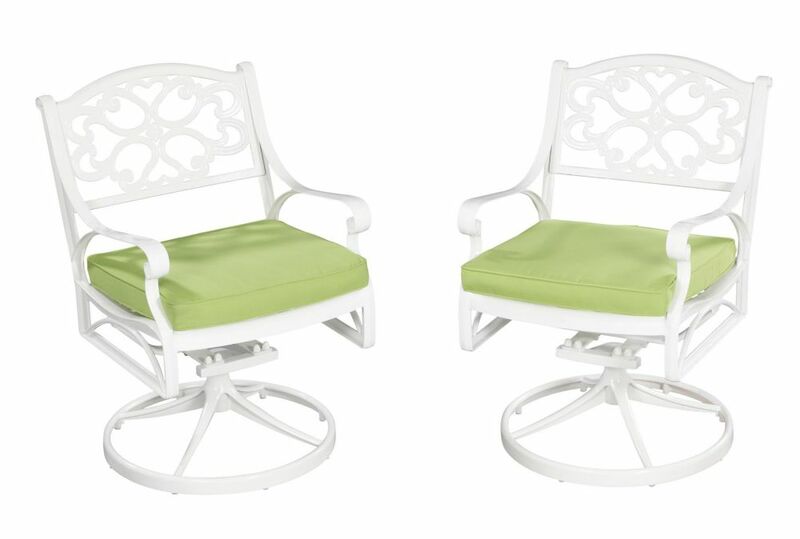 Biscayne Patio Swivel Chair in White with Cushion Home Styles Biscayne Swivel Arm Chair is constructed of cast aluminum with a white finish and Sunbrella <sup></sup> Green Apple fabric Cushions. Features include powder coat finish sealed with a clear coat to protect finish, and nylon glides on all legs. Item Size: 24.4w 22d 33.46h. Seat height 16h. Stainless steel hardware.